The Courier tablet computer is a late-stage prototype from Microsoft. As you can see it's not a tablet computer - it's more of a two-page booklet computer. 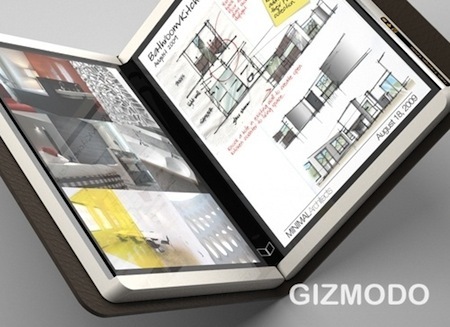 The device can use multitouch gestures and also makes use of a stylus for writing and drawing. 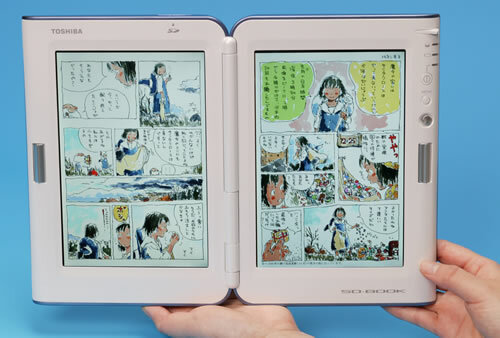 The two screens are connected by a hinge that presents a single home screen button. Fans of Neal Stephenson might be tempted to see these prototypes as two-page runcibles from his 1995 book The Diamond Age. ...Runcible, whose pages were thicker and more densely packed with computational machinery, each sheet folded four times into a sixteen-page signature, thirty-two signatures brought together in a spine that, in addition to keeping the book from falling apart, functioned as an enormous switching system and database.